Imagine this, you are in the state championship pre-game warm-up and you slide back to the goal post, smashing directly into it, nicking your skate blade. The nick is so severe that you have to leave the ice to get your skate sharpened by the equipment manager just before the game begins. The pre-game clock frighteningly ticks away and so does your mental focus. As the equipment manager rushes to get you your newly sharpened skate to you seconds before the team heads out of the locker room, you try desperately to regain your mental focus while getting dressed in a panic. Edge Protech’s inventor, Stan Matwijiw, Director of Bandits Goalie School and former Goaltending Coach for the Plymouth Whalers/Flint Firebirds of the Ontario Hockey League came up with the idea of Edge Protech while doing a private training lesson with professional goaltender, Jason Bacashihua during the summer of 2003. Matwijiw had Bacashihua pushing off the goal post and stopping at the top of the crease, then sliding in a butterfly position directly back to the opposite goal post, working on technique and repetition. After a few repetitions, Bacashihua became frustrated. He was no longer able to do the drill because his skates had become so nicked and dull that he no longer had a sharp edge to push with. On the car ride home, Matwijiw starting thinking how many times he heard goalies complain about having dull edges on their skate blades. Skate blades with dull edges from contact with the goal posts during practices and games were limiting his students. Matwijiw wanted to do something to help all goalies regain their confidence. Edge Protech owner, Joe Messina can recall Matwijiw telling him about the idea. When the conversation was over, Messina could only think of one thing, “The idea is so simple, but it will save goalies of all ages from the headaches of dull skate blades.” Messina quickly went to work on the formal design and the production of this unique product. 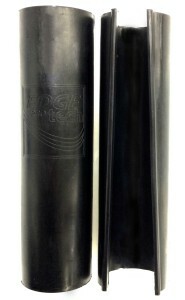 After 20 months of research, development and marketing, Edge Protech hit the hockey markets across North America in 2004. Within the first 6 months, Edge Protech quickly gained recognition throughout the entire hockey world. Fast forward to today and Edge Protech can be found in over 300 retail stores worldwide, used by every team in the NHL, has appeared on Coaches Corner with Don Cherry and was used in the 2010 and 2014 Winter Olympics. With over 30,000 sets sold worldwide since 2004, Edge Protech has now become a symbol for goaltender skate blade protection at every level of hockey in the world. The product configuration and logo of Edge Protech is a trademark and patent of Edge Protech, LLC. Edge Protech is registered in the US Patent and Trademark office.